When I first arrived in Athens, a man asked me where I was from. When I said New York, he said "Well, New York might be the center of the universe now, but Athens was the center of the universe many years ago." That framed my visit. Interspersed with modern day Greece are stories of so many waves of history: the Greek Empire, the Roman Empire, the Ottoman Empire... Christianity vs Islam. It was all very powerful. There is something so inspiring about standing on such historical ground and listening to the stories that are told in a matter of fact sort of way but capture important historical moments. Plus in Athens history continues to be excavated. But Athens is also very much a living city. As an avid, street art explorer, I was thrilled to see a vibrant colorful canvas. 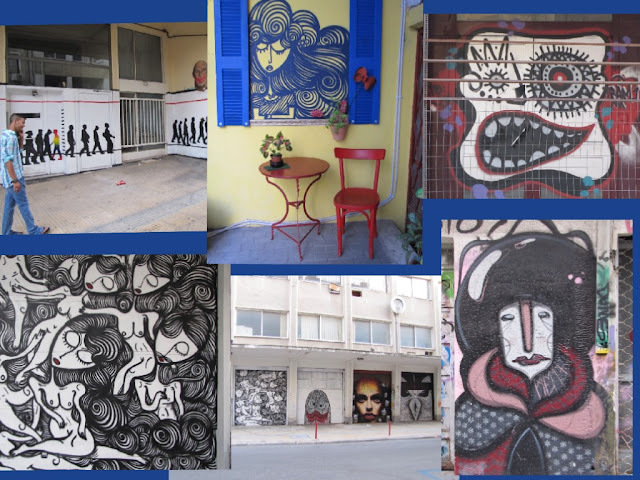 Click here to see my Athens Street Art online album. I also just enjoyed being with the direct and hard working Greeks who are slogging through this hard economic time, doing the best they can. Greece is the center of the EU crisis these days, and getting personal insights adds depth to all the headlines in the beautiful way only first hand travel can.